When a thermostat powder is exposed to elevated temperature, it will begin to melt. As the material begins to melt, it will flow out and then chemically react to form a higher molecular weight polymer in a network-like structure. This cure process, called crosslinking, requires a certain degree of temperature for a certain length of time in order to reach full cure and establish the full film properties that the material was designed for. A convection oven uses a heat source, most commonly a gas burner, and a fan to heat the interior of an insulated enclosure. Different powder materials require different cure temperatures, commonly in a range between 150-250 degrees celcius. The part is heated by the hot air in the oven and it in turn conducts heat into the coating. 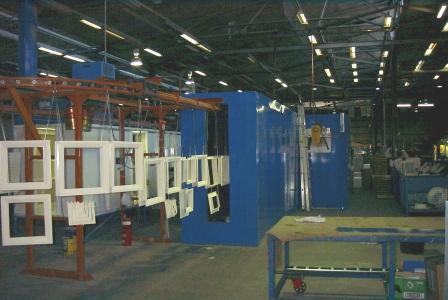 The coating must be held at temperature for a predetermined length of time to reach full cure. So the cure cycle is so many minutes at so many degrees of temperature. The time it takes to bring the metal up to temperature must be added to the cure time requirement to determine the full cycle time in the oven. Convection cure time may be as short as 10 minutes or as long as 30 minutes, depending on the mass of the substrate and the cure requirements of the powder. Convection curing is dependable and flexible. The oven can be adjusted along a full range of temperature requirements and the line speed can be adjusted for the time requirement. 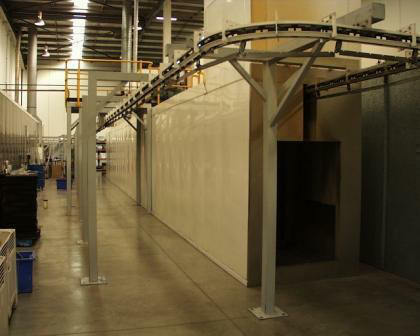 The part can be exposed for a longer period of time than what is called for, usually with no change in colour, gloss or performance in the coating. Energy consumption is related to the load of product, the amount of insulation and volume of exhaust. Typically, a gas-fired oven is very efficient and cost effective. The oven is built using double skin, tongue and groove insulated panels, together with high temperature 350 degrees celcius fibreglass insulation. Cure oven ductwork is designed to circulate air in a way that will maintain even heat throughout the oven and not create turbulence. Excessive air velocity in the cure oven can cause powder to be blown off of parts. It can also cause parts to swing around and hit other parts or the walls of the oven. 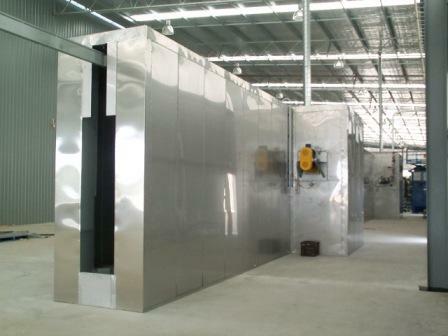 The oven size will depend on the size and mass of the product to be run and the production volume. The oven must be sized to handle the largest part with enough burner capacity to handle the heaviest load of product. A batch oven cycle time will typically be around 15 to 20 minutes. The oven interior should be big enough to handle 20 minutes worth of production. Even airflow and temperature balance in a convection oven is important. If there are areas that are not even in temperature the coating may not be uniformly cured and colour and gloss may vary.